Event Description The Hippy Killer Hoedown takes place at the Farmers Fairgrounds, 18700 Lake Perris Drive, Perris, CA. on April 14, 2018. The Hoedown was created for automobile and motorcycle enthusiasts and their families. Expect live music, free giveaways, custom cars, vans, and motorcycles. Main gates open at 10 am to 8 pm. This is a family friendly event. Admission $15.00 per person, small children free. If you would like to get involved with the Hoedown, please contact us. For more information check us out on Instagram and Facebook. Purchase your advance tickets here. 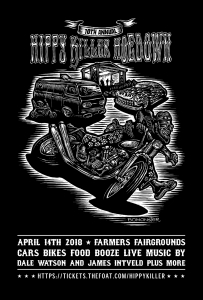 Location Farmers Fairgrounds, 18700 Lake Perris Drive, Perris, CA.